This set of special tools is designed to help speed the removal and ease the overhaul of a Garrett T-3 turbocharger on a 617 turbo diesel engine. These wrenches or ones similar to it, are necessary in order to remove and disassemble a Garrett T-3 without the necessity of removing the entire turbocharger assembly from the exhaust manifold. At first glance, you might think these tools are expensive. The cost is primarily in the labor to make them on a limited production basis by hand. If you opt not to purchase these tools, just be forewarned. Many customers who opted not to get the toolset, came back with emails telling us all the problems they had getting the turbo off and apart and getting the shaft nut torqued properly. The modified pick tools and black plastic turbine wheel holder are handy no matter which way you remove the turbo. The short, cut-off wrenches are the only way you can get to a couple of the bolts without removing the turbo from the engine. PLEASE READ CAREFULLY BEFORE ORDERING: This toolkit has been slightly modified from the original kit Kent produced and shows being used in the turbocharger kit instructions. This kit will do the same operations. JUST KEEP IN MIND that the instructions will explain using a couple different looking tools. The curved box end wrenches are still the key. All but a couple tools in the kit have been modified by Kent in our shop. 1/2 inch and 13 mm box end wrenches have been bent to a curve and other 13mm and 1/2 wrenches have been cut short as shown in the picture above. These wrenches allow better access to the bolts that hold the turbo to the turbine housing. The combination 3/8" - 10 mm wrench that is welding together becomes a universal "T" wrench for properly tightening the critical turbo shaft nut. Here is a picture of one of the special wrenches in use. You might think there is enough room here for a regular combination wrench, but not so much if you are leaving the turbo on the engine. Space gets really tight! Along with the wrenches, Kent also modifies two of the pick tools. One ground pick tool is used to clean the sealing ring groove and one with a modified tip is to aid in the removal of the internal snap rings. 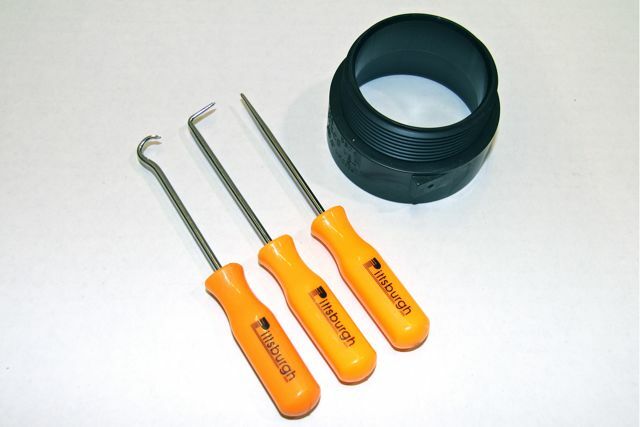 If you have your own pick tools or small snap ring plier set then you may not need these. The black plastic pipe coupling is used to support the turbine wheel during reassembly. Very fine sandpaper is included to help "polish" the ring sealing surfaces. If you purchase our pick tool set separately PLEASE BE AWARE that they have NOT been modified for use in getting the turbo bearing clips out. NO INSTRUCTIONS: Detailed instructions for the use of these tools are only included with our turbocharger overhaul kits.